Daniel “the Swede” Kratz, Suzanne Guibert and Ian Phalen ride old Highway 200 outside of Hope on the first day of the tour. Beautiful Lake Pend Oreille and the steep Green Monarch Mountains loom in the background. The process starts by hatching a loose plan and then selling it to your gullible friends. “How does four to five days of swimming, camping and cycling around the lake sound? We will stay as close to the lake as possible, sleep every night under the stars, and ride as much single-track as we can find. You in?” I asked 30 people, and only four committed. The first two takers were the Swede, also known as Daniel, an outdoor guide for one of the “bad kid schools”; and Ian, ex-river guide and wannabe Renaissance man. Wyatt, a local builder and old-school bike nut soon signed on. Much to our delight Suzanne, our badass female representative, could not resist the call. And finally there was me, the long-haired, counterculture photographer with nothing better to do than brainstorm crazy bike rides. Mapping out the route was simple. Find campsites that are about a day’s ride apart, locate all downhill single-tracks that are close to the route and find as many swimming holes as possible. Be forewarned! This ride is not for the weak. There is more than 9,000 feet of climbing on this 100-plus-mile route! We chose the last week in August 2006 to make our siege. The lake would be the perfect temperature for swimming at the end of each day’s ride. After weeks of planning, we assembled early one morning in my backyard and packed our gear. We chose to delegate the creative responsibilities. I would focus on the photos while Ian would kindle his Renaissance spirit and take over the task as wordsmith. So sit back in your armchair, and enjoy the ride. Liberated! We were off like a herd of turtles with our homes on our backs. I love turtle travel: self-contained and self-propelled in remote areas. In years past I have trekked through mountains on foot and skis, paddled wilderness rivers and tropical coastlines in a tightly stuffed kayak, and toured with panniers strapped to a bicycle. This time my gear was stowed in the new B.O.B. trailer behind my mountain bike. We slipped through downtown Sandpoint in a brightly colored train topped with yellow flags. Final supplies packed and mechanical needs dealt with, our crack-of-noon club broke suction and eased out of town on a big lap ’round the lake. at the Old Ice House Pizzeria in Hope. Like Tom and Huck we ducked through construction fences and backyards to access a lakeside dirt track headed east. The day was already hot, and we were tempted to go swimming, but we kept our momentum rolling toward fresh oases. This was the time to get used to the weight and handling of the trailers. Black Rock challenged us with a short but steep trail requiring a team bicycle drag. Next we worked together to carry over some railroad tracks. I was both convinced that this is a cool way to travel and sobered by the limits a heavy trailer imposes off pavement. Stimulants! Back on pavement for the Highway 200 push to Hope we came upon a welcome sight. The Colburn-Culver turnoff has an espresso stand. Afterburners lit, we made good speed until we crossed the Pack River. A bull moose was browsing mere yards from tractor trailers and rolling real estate (RVs) cruising by at 55 mph. Having survived that hairy and (Suzanne’s) skirt-raising leg of the journey, we happily exited the highway bound for the Old Ice House Pizzeria. Following a team meeting we bought pizza and focaccia for dinner and continued on to find lunch at Hope Market Café. Frosty mugs of ale greeted Daniel and me while our fresh sandwiches were constructed. Chris and Suzanne met Outskirts Gallery owner Kally Thurman and were shown a collection of handmade artist’s brushes. A young black bear bounded across the old highway southeast of Hope. I anxiously kept an eye out for its mama while our group filed through. For a few miles we rode parallel to the busy highway 200 with an impressive vista of the lake over Denton Slough. Some last minute goodies, snacks and a six-pack topped my load as we steered onto the Clark Fork River bridge and left the pavement. Camp for the night was Johnson Creek Recreation Area. Enough sun remained to swim and wash off the day’s sweat. Our tents set up and beds made, we relaxed and contemplated the next morning’s 2,700-foot climb to Johnson’s Saddle. I was ready for bed when Wyatt materialized out of the dark to complete our posse. He had worked all day on a roof, hurriedly packed and rallied to catch up with us. The Swede relaxes at Whiskey Rock to cool off after Day Two. Tequila and cheap beer helped ease their sore muscles. The morning sun dried our camping gear as we consumed calories and drank lots of water. Soon enough we were cranking up a steep dirt road with muscles burning. Shade was rare but much appreciated on this relentless climb. Motor vehicle traffic was minimal: A potty pumper truck bathed us in dust and diesel fumes, and near the top a minivan from out of state stormed past, soon to return with windows lowered to ask the prerequisite directions. At the saddle we paused to regroup after two hours of intense effort. Every intersection and hilltop provided welcome rest spots to fall off our bikes and chow down on energy bars and snacks. As a group we decided to coast down the ridge a couple miles to have lunch and take a vote on riding Trail No. 606. There were many things we did not know about this single-track trail. Was it clear of fallen trees? Could we ride it with the trailers? Will it connect with the road to Whiskey Rock? Adventurous spirit overcame us and we chose the risky trail over the safer gravel road. I felt giddy in anticipation of the unknown trail before us. Several miles away and hundreds of feet below us lay the lake. Downhill! What a blast! Screaming down the single-track trail with brush whipping past, I had to remind myself of the 45-pound trailer connected to my rear axle. Terms like “lengthened stopping distance” and “momentum” flitted through my head as I encountered the first of many steep switchbacks. As overheated brakes squealed, I dove into the turn, any chance of stopping now forfeited. There was a moment of uncertain wobble as the trailer crossed the fall line of the slope and rudely pushed and skidded my rear tire toward an abysmal drop-off. I shifted my weight back and into the hill and, whoosh, we were off down the trail. OK, speed feels great, but think ahead, way ahead. The added weight of my turtle shell took some getting used to, but I soon learned to enjoy letting it go, flying like a comet with a tail of dust in my wake. Sorry Suzanne, did I lose anything? Daniel rounds a tight corner on the Bernard Peak trail. The trail spit us out on Road No. 2296 with silly grins on all our faces and giggles in our throats. A few battle stories had to be shared immediately, but the lake beckoned. A shady dirt road whisked us down the steep drainage to our first glimpse of the lake’s blue water. Private road. Up we groaned on another hot and dusty ascent. The views were inspiring, but I think we all had a refreshing swim in mind. Are we there yet? Finally a sweeping descent led us into Whiskey Rock Campground. Paradise found! We chanced upon a vacant campsite with sweeping views of the lake and adjacent shoreline. Daniel and I scrambled down to a tiny cove where we swam and rinsed the salt and dust from our riding clothes. Chris, Suzanne and Wyatt eventually joined us for some sun worship, swimming and a tasty margarita on the rocks. I felt I was in the right place at the right time. As the cool of evening approached, we trickled back to camp. Daniel wandered around greeting fellow campers. He must have made quite an impression, because he returned with an outsized martini and, later on, a partial bottle of vodka. Must have been the Swedish accent. Good friends and a spectacular sunset closed an epic day. An early start was agreed upon. We planned to climb more than 3,000 feet from the lake to Bernard Peak. First we had to reach the southeastern end of the lake near Lakeview. The optimist in me will describe a rolling dirt road with frequent scenic vistas. The realist recalls a long series of climbing up and dropping down, repeating until I was exhausted. Near Lakeview, we ate electrolyte candies, and I drank my last energy drink. The dreaded heat of the day became a reality as we climbed the rocky road less traveled to Bernard Overlook. My heart sank and my legs wilted when I saw a dormant bulldozer. Our “road” had a trench carved out of the middle and was strewn with loose boulders and shattered bedrock camouflaged by 6 inches of talcum powder dust. My rear wheel mired deep in this mélange. There is nothing wrong with pushing one’s bike when a steep track becomes unrideable. It’s just not very fun. The production line of slumbering earthmovers finally behind us, the road improved somewhat and we returned to pedal power. The overlook was a stunning location for lunch. We only had the water we carried. I had a fair amount left and shared with Chris, who appeared to be dehydrated. Each of us danced on the edge of collapse en route to Bernard Peak. The rest of the climb is a salt-encrusted blur. I caught up to Daniel several miles short of the summit. He stumbled off to lie in the shade while I unhooked my trailer and prepared to do something I would likely regret. Wyatt and Suzanne stared quizzically as I zoomed past them back down the hill. I found our fearless leader about a mile back with his head under a dripping culvert. Chris was still recovering from a mild illness. We transferred his trailer to my bike and set off to join the group. After a short rest we continued on together. Daniel and Wyatt led us to the Bernard trailhead just below the summit. We had been looking forward to this moment all day. Bernard Peak Trail unrolled like a brown carpet as the lush, mixed cedar-and-pine forest swallowed us. Caution dissolved as we jumped roots and swooped through graceful turns. Steep, slippery switchbacks were a true test of nerve, but we were too busy to worry. Five miles of fun later, we coasted down into the asphalt maze winding through Farragut State Park to our campground. Hot showers made us presentable, and frosty margaritas and a feast in Bayview revived us. Prior commitments dragged Suzanne and Wyatt away before day four. Chris, Daniel and I ditched our trailers for the eroded, overgrown and strictly motorcycle-oriented Three Sisters Trail. From Cocolalla Lake we spun up the highway to the Sagle bike path and across the Long Bridge. Following a covert skinny dip, we stumbled into Eichardt’s Pub, completing a lap ’round the lake. If you don’t have the vim to go on an around-the-lake epic, try one of these local rides for your two-wheel fix. Beginners will find Farragut State Park in Bayview an excellent gateway. Obtain a trail map when you purchase an entry pass at the visitor center. First timers can sample rolling single-track buffed to perfection. As skills and appetites increase, technical rocky sections can be found among the numerous intersecting trails. More than 30 miles of single-track await discovery within 4,000 acres. Smile! Directions: From Sandpoint head south on Highway 95 to Athol and turn left on Highway 54. Drive 4 miles to the park entrance and follow the signs to the visitor center. Mineral Point offers nirvana to intermediate riders. The biggest challenge this trail presents is remaining astride your bicycle as breathtaking views rip your attention from directing your front wheel. Built atop an undeveloped stretch of lakeshore, the trail winds through mature cedar groves and climbs to several cliff-top vistas of the Green Monarchs and the vast waters of Lake Pend Oreille. 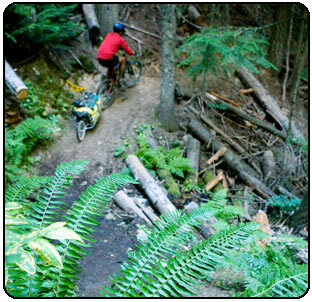 Each short but tricky climb rewards the fat-tire junky with a silken descent mixing roots and mossy rock outcrops. The traditional locals’ loop starts at the boat launch in Garfield Bay. Get on your bike and turn right out of the parking lot. After 0.2 mile take a left and climb toward Green Bay. Within 0.2 mile the pavement ends. Another 0.2 miles brings you to Green Bay Road No. 532. Go right and climb 1.3 miles to a junction with Forest Road No. 2672. Stay left and continue 1.9 miles to a junction with Road. No. 532A. There is a sign directing bikes left down the road. To maximize our single-track, we dive left onto Lost Lake trail here for a quick out-and-back side trip. For the main loop take a right to reach Mineral Point Trail No. 82. The 2.1-mile trail will deliver you to the smooth, stoney beach at Green Bay. Finish the loop by riding up Road No. 2672 back to the junction and down to your car. Directions: From the south end of the Long Bridge, head 3 miles south on Highway 95 and turn left on Sagle Road. After 7.4 miles turn right on Garfield Bay Road. Continue 1.2 miles to the public boat launch and park. 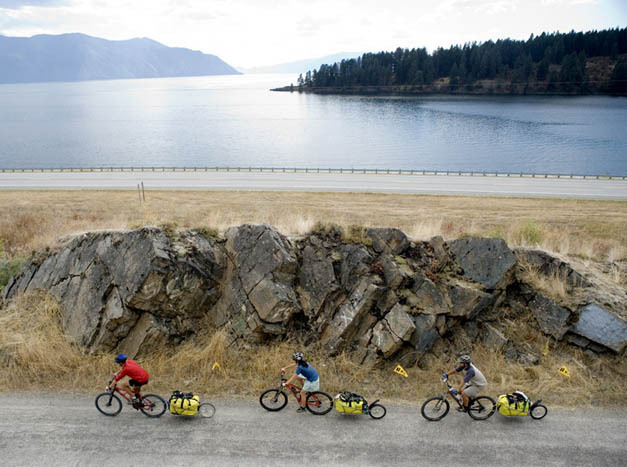 The Pend Oreille Pedalers (POP) members have been so busy clearing and building trails and creating an annual bike festival, it’s amazing they still find time to do what they are truly passionate about – riding their bikes. The bicycling club hosts weekly rides for both roadies and mountain bikers, along with club rides on weekends once a month. POP formed two years ago to promote cycling. “It seemed like so many folks ride around here, it was time to create a group, and the Pend Oreille Pedalers began,” President Chris Bier said. The membership has grown to 85. Mountain bike riders need trails in order to ride, and members have been taking note of trails being lost to development. Thus, the Pedalers are not only working to keep access open, but members are also building miles of trail. With hundreds of hours of volunteer labor, crews using picks, shovels and rakes have already built some 2 miles on private land off Syringa Heights Road, where a property owner graciously allowed public access. This one trail, Sherwood Forest, has arguably become the most-used trail in the area, for both bikers and hikers, partially due to its close proximity to town and its suitability for beginners and intermediates. POP created a trail map with directions to this and other trails, available free at local outdoor stores and bike shops. To learn the ropes, POP invited an International Mountain Biking Association trail crew to spend a few days teaching members the correct way to design and build a solid, low-maintenance trail that won’t erode. “When folks tell us how much they love hiking and riding here, we just smile and tell them we’d love to have them spend some time with us on the next trail workday. Many hands make light work!” said Bier. In keeping with that philosophy, POP does trail repair in partnership with the Back Country Horsemen. The group received a Recreational Trails Program Grant last September, in conjunction with the U.S. Forest Service, to build an additional 3.5 miles of trail at Mineral Point, a popular site on the west side of Lake Pend Oreille (see sidebar, page 86). This new trail will link the Lost Lake Trail with the Mineral Point Trail, creating a loop. The trail will be relatively flat with spectacular, sweeping views looking out toward the Green Monarch Mountains and the Clark Fork River delta. POP members hope that the work will be completed early in the fall of 2007. 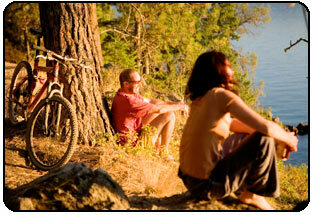 This year’s bike festival, The Pend Oreille Pedal Fest, takes place June 16-17. See calendar, page 26. 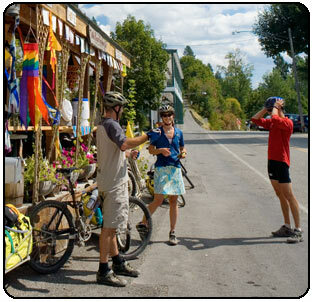 Learn more about the Pend Oreille Pedalers by going to www.pendoreillepedalers.com, or visit a local bike shop.